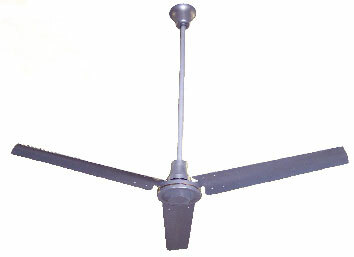 Moisture/Dust Resistant Industrial Ceiling Fans Come Completely Assembled (except blades). All metal construction. No plastic canopies or blades to burn, melt, or crack. Variable speed capacitor type, impedance protected, 18 pole "F" frame A/C motor. Cast Aluminum motor housing. Integral bi-metal Firesafewired to line voltage with automatic shutdown (135 F) and reset. Fire sensor to be mounted in the yoke cavity above and seperate from the cast aluminum motor housing. 3/4" O.D. steel down rod, drilled and clevis pinned to motor shaft. 3/8" x 7 1/4" steel J-type mounting hook with spring steel safety clip and aircraft type lock-nut to prevent spin-off or falling. 18/3 SJT power cord with black jacket & 3 prong molded plug. 80 c, 10 amp., 120 volt rated, or wire leads. Factory installed type 304 stainless steel internal safety cable, 7" x 1/16" diameter, 480# breaking strength. Self-locking 1/4" blade bolts with PVC coated threads. Custom down rod lengths are available. Pricing below reflects lengthening the down rod pole, lead wires & safety cable. Note: There is a 3-Fan minimum when ordering custom colors. White is the standard color. Paint is a wet coat enamel. Powder coating is available on a per quote basis. There is a 12-Fan minimum when ordering custom powder coating. Powder coat colors can be viewed by clicking here.